Can I use an old flash unit with a digital camera that has an external flash connection? Yes providing the flash unit dose not have a High trigger voltage. A camera will use the flash trigger voltage to fire the flash at precisely the right time. If the voltage is to high internal electrical damage can occur to the camera. All flash units manufactures within the last 15 years are ok, if unsure call a camera service center to check. 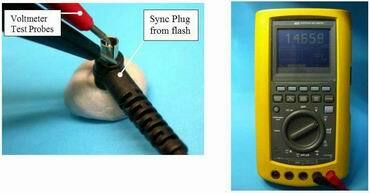 To check a flash trigger voltage yourself, measure the sync plug or hot shoe. Using a voltmeter on DC, rang set to 200 volts or above, flash unit on and charged (don’t worry its quite safe) expect the flash to trigger while testing. Above 180 Volts don’t use it. If your camera has a hot shoe not a sync socket you can still use the flash with a Hot shoe adapter.